Keep your color vibrant and protected with our Color Care Protecting Conditioner! This formula is infused with positively charged molecules to ensure that your color adheres and your creation lasts longer! Water (Aqua/EAU), Cetearyl Alcohol, Behentrimonium Methosulfate, Quaternium-91, Cetrimonium Methosulfate, Sodium PCA, Simmondsia Chinensis (Jojoba) Seed Extract, Equisetum Arvense Extract, Rosmarinus Officinalis (Rosemary) Leaf Extract, Helianthus Annuus (Sunflower) Seed Extract, Arnica Montana Flower Extract, Theobroma Grandiflorum Seed Butter, Panthenol, Citric Acid, Hydrolyzed Oats, Hydrolyzed Cottonseed Protein, Hydrolyzed Soy Protein, Ethylhexyl Methoxycinnamate, Fragrance (Parfum), Arginine, PCA, Glycine, Alanine, Serine, Valine, Proline, Threonine, Isoleucine, Histidine, Phenylalanine, Methylchloroisothiazolinone, Methylisothiazolinone. 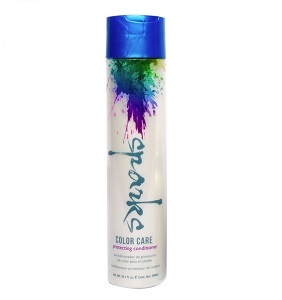 For best results apply after using Spark Color Care Sulfate-free Shampoo. Rinse with cool water. Follow with Sparks Color Care Protecting Spray.